« Another Beautiful Day Today! A little warm today! Expect to see upper 80s or low 90s. Tomorrow, more of the same, but by Friday, we might see rain with temperatures in the mid 80s. By Sunday, it should clear out. Temperatures will remain in the upper 80s to low 90s and slight chances for showers are around almost every day. No changes in the generation schedule. Pretty much non-stop for a while. Glad to say, we continue to have good days on the water. Gina had Derek and his son, Bart on the water yesterday. Good day for them on the tiger tail, ruby 2 or lightning bug droppers and a chartreuse egg pattern. Stripping was the best method, but they caught fish nymphing. Bob, from Indiana, spent the morning with Stan. They too, did best stripping. Their pattern was the holographic green crackleback. Also caught some on the lightning bug and a bright pink egg pattern. 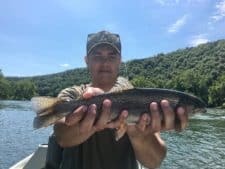 This entry was posted on Wednesday, June 28th, 2017 at 12:08 pm	and is filed under Fishing Reports. You can follow any responses to this entry through the RSS 2.0 feed. You can leave a response, or trackback from your own site.